Cryostimulation, as a method of stimulating the body´s own neuroreflexive responses to combat pain and is a todays technique of choice fort he daily treatments of accute or chronic pain. Cryofos is using an intense cold therapyby hyperbaric medical Co2-gas. From its pressurized, liquid form in the cylinder, the gas streams out when the valve is opened to emerge from the nozzle of treatment gun as fine spray, which hits the skin at a temperature of -78°C and a pressure of 1-2 bars lowering the skin temperature to between 4°C and 2°C within just 30 seconds. This abrupt temperature change is called a thermal shock and it generates a neuroreflexive response in the body which ultimately results in an increase of blood flow in the treated area, whilst reducing the contractions of pro-inflammatory mediators ( for example : prostaglandins and histamines). In addition, the thermal shock combined with the pressure of the gas has an effect that is similar to a manual lymphatic drainage. By this method oedems, haematomas and local inflammations will be reduced much faster than by already known therapies. Analgesic effect through the inhibition of nociceptors. In the acute phase, such suppression is aimed at alleviating acute pain and preventing unwanted changes in the brain and medulla. In the chronic phase, morphological reorganisation processes are stimulated; this restores normality and results in absence of pain. Indications are: Acute sports injuries, bruising, haematomas, strained or torn muscles and rheumatism. In addition, epicondylitis radialis and ulnaris, heel spur, arthrosis of the knee, upper ankle joint and vertebral joint as well as lumbar sciatica, chronic back pain, Sudeck´s syndrome stage I and II, post-surgery treatments and many more. The average treatment session per patient lasts a mere 1-2 minutes, which can be easily accommodated in your consultation schedule, even at short notice. 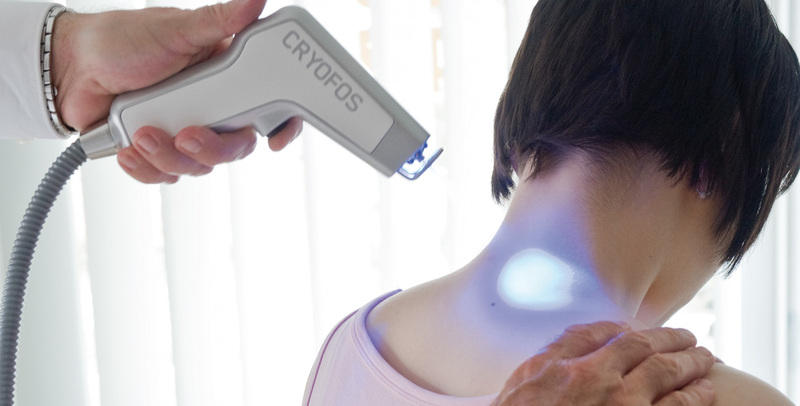 Added to the therapeutic benefits with Cryofos the relatively low overhead costs to your practice and the extremely short treatment sessions add up to a substantial financial advantage over alternative, comparable methods, from which both you and your patients benefit. The physical dimensions and ergonomic design of office medical equipment is often the key to a swift, economic and safe work process. 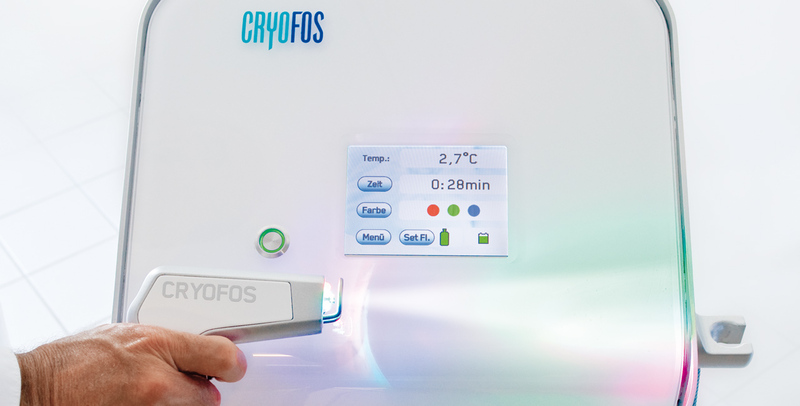 CRYOFOS has been designed with the typical requirements of in-office work in mind. The operating elements are deliverately simple and the ergonomic design of all the compononents is nothing short of excellent. The compact design allows you to move and use CRYOFOS in the narrowest spaces, and makes it easy to store out of the way when not in use. 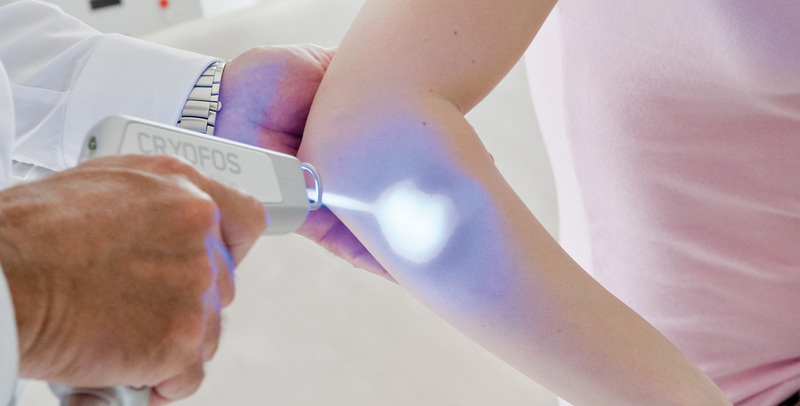 The built-in infrared sensor, which measure the skin temperature of the area being treated, allows you to work precisely and efficiently ? ideal for delicate work around fresh stitches or on patient´s face. The quality and reliability is everything you expect from innovative technology "made in Germany". The device has been developed and designed with painstaking and thorough attention to even the smallest details, in order to arrive at a robust and maintenance free product.